Being a great leader is something that requires some effort. Dr. John Maxwell says, “Leadership develops daily, not in a day.” So to become a better leader you must have a daily process that helps you think about leadership issues. Daily think about your skills as a leader and understand in what areas you excel and understand the areas you are not as skillful. This self assessment will make you realize that as a leader you can’t be everything to everyone. You must rely on others to lead in the areas in which your leadership skills are weak. This self assessment should lead you to improving yourself by studying leadership skills to raise the level of your leadership effectiveness. Good leadership requires a good relationship with those you seek to lead. If you don’t know your followers, and they don’t know you, you haven’t established a foundation on which to build trust. Being trusted is essential for a leader. 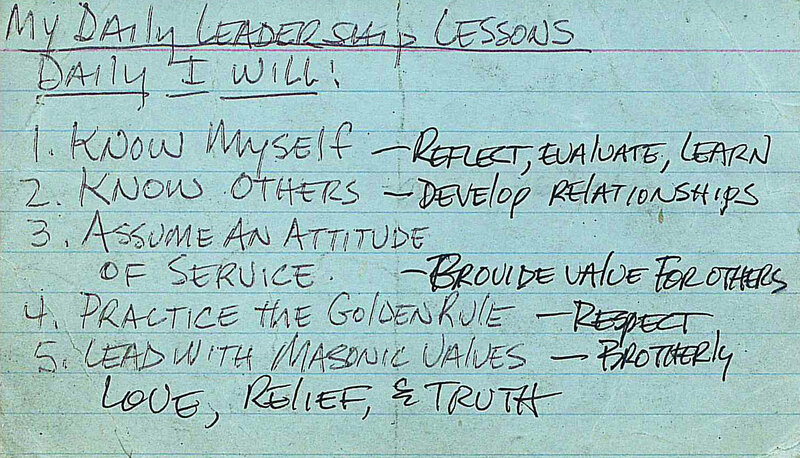 Lodge officers have a great head-start on trust because as Masons we are taught to trust one another without question. Start to talk with your brothers and get to know them. Find out what they like, dislike and what they believe will improve your lodge. Establishing these relationships will make you a stronger leader. Having the wrong attitude as a leader will lead you into disaster. Just because you have been given a title doesn’t make you a leader. Your title means that you have been given responsibilities and a good lodge leader understands that because of these responsibilities he must make decisions that are good for the lodge and not himself. This attitude of service also means that a lodge leader must be willing to make some personal sacrifices to ensure he fulfills his lodge responsibilities. An attitude of service will bring you respect as a leader. This may sound rather simple, but it is powerful for a leader. If you as a leader treat your followers as you wish to be treated, it will lead to mutual respect and trust. This will lead to creating a very solid foundation as a leader. Because you have a title and authority doesn’t mean you can ignore the tenets of Masonry; Brotherly Love, Relief and Truth. As a lodge leader remember those you lead are the same as you so practice Brotherly Love. If disagreements occur, a lodge leader should recognize that the brethren are troubled and strive to find relief for them, and always remember that Masonry is Truth and Truth is Masonry.